As the titles suggests, here is my custom sticker for the Palace Cinema, just thought I would share, has anyone done one similar? Looks great! but don't you think it would be better if it was a specific episode, say, Return of the Jedi? I was going for the original 77 release before it became a saga, thought that fitted better with the style of the modular itself, otherwise it would of been Empire Strikes Back! edit: ah, I see @Agent_Debris beat me to it. Really how did I miss that!? I say take a Bioshock alternate universe approach and go with "Revenge of the Jedi"
Lol, I think I'll go for "The phantom menace strikes back"
Or our universe in November 1982 before the title was changed. It occurs to me that it'd be pretty simple to re-create the Palace sticker sheet in Adobe. A great chance to personalise a set for a loved one this Christmas. 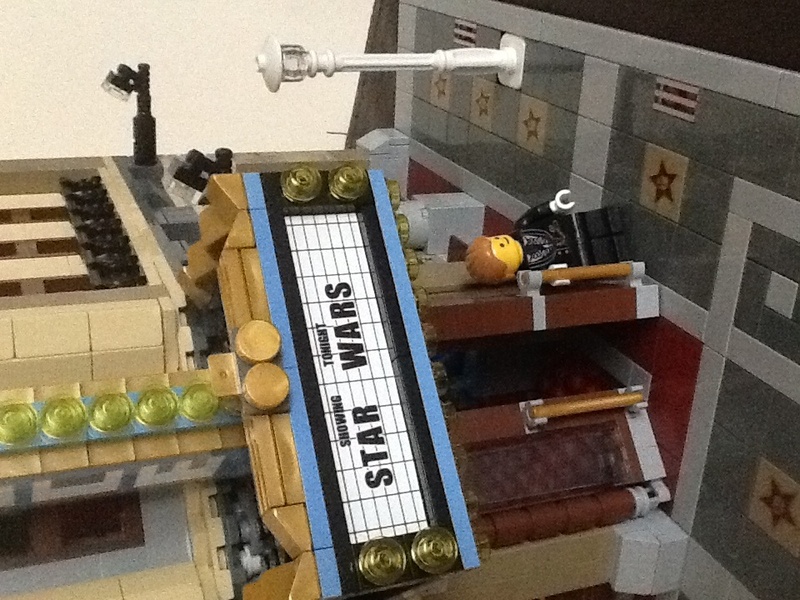 My brother has been trying to make some movie posters for some of the LEGO licensed themes to go with the Palace Cinema. It seems like it'd be easy, since LEGO has released LEGO versions of several of those movie posters through their website, but it turns out that it's actually surprisingly difficult to convert into the simple palette of flat colors that tends to characterize LEGO sticker sheets (I'm not fond of simple printouts of full-color images — a lot of the time, complex gradients and photorealistic details look out-of-place in a toy that tends to be broken up into broad fields of flat color). Not really. In our universe it was never listed on any marquee like @Agent_Debris did, just on some rare posters and promotional materials. FYI, the Lego Movie poster that was made for the PC is full, photorealistic color. Yeah, I know. It kind of bothers me, though I understand that since it is basically a downscaled version of an official movie poster, TLG and Warner Bros. might not like to see it reduced in detail. Reducing the detail too much would also kind of spoil the whole point of the LEGO Movie logo, which is that it's made from actual LEGO pieces. I have a custom ESB poster. It is just a photo of Darth Vader (the minifig) with the ESB logo. Simple but effective.